Urban legend has it that early models of Verner Panton's stackable S chair if sat upon with too much force – not so much because the designs were explosive, but because the materials used for this first single-material, single-form, injection-moulded chair were still in the experimental lphase of development. Experimentation into moulded plastic furniture started in the '40s; since then designers like Panton, Charles and Ray Eames, Eero Saarinen, Jasper Morrison, Karim Rashid and Philippe Starck have explored the innovative possibilities of thermoplastics. 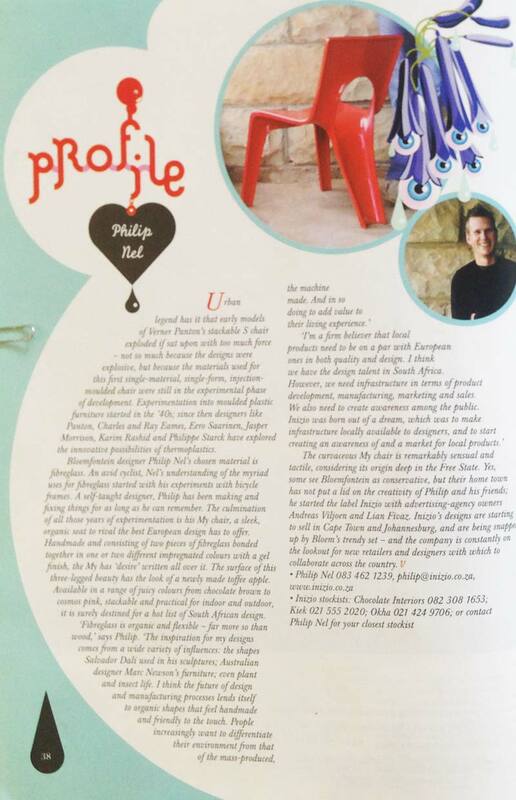 Bloemfontein designer Philip Nel's chosen material is fibreglass. An avid cyclist, Nel's understanding of the myriad uses for fibreglass starded with his experiments with bicycle frames. A self-taught designer, Philip has been making and fixing things for as long as he can remember. The culmination of all those years of experimentation is his My chair, a sleek, organic seat to reval the best European design has to offer. Handmade and consisting of two pieces of fibreglass bonded together in one or two different impregnated colours with a gel finish, the My has 'desire' written all over it. The surface of this three-legged beauty has the look of a newly made toffee apple. Available in a range of juicy colours from chocolate brown to cosmos pink, stackable and practical for indoor and outdoor, it is surely destined for a hot list of South African design. 'I'm a firm believer that loal products need to be on a par with European ones in both quality and design. I think we have the design talent in South Africa. However, we need infrastructure in terms of product development, manufacturing, marketing and sales. We also need to create awareness among the public. Inizio was born out of a dream, which was to make infrastructure locally available to designers, and to start crating an awareness of and a market for local products'. The curvaceous My chair is remarkably sensual and tactile, considering its origin deep in the Free State. Yes, some see Bloemfontein as conservative, but their home town has not put a lid on the creativity of Philip and his friends; he started the label Inizio with advertising-agency owners Andreas Viljoen and Lian Fivaz. Inizio's designs are starting to sell in Cape Town and Johannesburg, and are being snapped up by Bloem's trendy set – and the company is constantly on the lookout for new retailers and desgners with which to collaborate across the country. Inizio Homes ©2015 All rights reserved.